The 70th anniversary of Independence celebrated tomorrow comes a week before a major test of the progress of democracy in the country, with the Local Government poll very much taking the image of a national referendum on the progress of the government, and the battle against corruption in the country. It raises questions about success of the present unity government in keeping on its pledge to effectively fight the corruption of the previous regime, and raises major questions on the ability of the government to carry out clean governance in the country. The independence anniversary will no doubt recall the leaders of the country associated independence, and the path laid out for the progress of democracy in the country. The name of the first Prime Minister D. S. Senanayake stands out high, despite certain shortcomings. The issues relating to the later leaderships of the Bandaranaikes as a wide family of leaders, and the subsequent Rajapaksa leadership, as well as, the footprints of the many Opposition leaders, especially from the left parties are also remembered. This also reminds one of the shortcomings the country faced in leadership and politics of governance. The failure to achieve effective economic and social progress, leading to two left wing insurrections; the inability of all governments to properly deal with communal relations in the country, leading to a major terrorist war of separation, defeated by the last government; and the continued failure to achieve good and effective reconciliation will remain issues of concern in the post-colonial democratic process. This background has a definite impact on the Local Government poll campaign now moving to its strongest rivalry. The UNP, founded by D.S. Senanayake and his supporters that formed the first government in a free, post-colonial country remains the single strongest party in this election campaign. It faces opposition by the SLFP founded by SWRD Bandaranaike, who left the UNP mainly due to the leadership issue, due to DS Senanayake promoting his son Dudley Senanayake to succeed him, and then moved to left wing nationalizations and wider communal politics, and the SLPP clearly led by Mahinda Rajapaksa, who gave a fully family-oriented leadership of the SLFP; moving away from the Bandaranaikes to the Rajapaksas, with continuing emphasis on communal politics, with the considerable achievement of defeating Tamil separatist terrorism of the LTTE. This is clearly a three-cornered contest, in the majority Sinhala areas comprising seven of the nine provinces in the country. The politics of Tamil and Muslim communalism have a major impact on the other two provinces; and to some extent in urban areas elsewhere with strong communities of the Tamil and Muslim minorities. The Central Province has a very strong population of plantation Tamils, growing in political importance. The question that arises is what all this has to do with Local Government politics where the focus should be on the management of the local authorities in the country. It is evident the stuff of national politics transcends local government matters, especially with this being the first major event to seek public opinion on government after the major political changes in January 2015, and also the deliberate delays in holding these polls. President Maithripala Sirisena, who leads the SLFP and UPFA, after failed attempts at an alliance with the Rajapaksa-led SLPP on these polls, did bring the campaign to focus on corruption with emphasis on the Treasury Bond issue, seeing the path to attack both his coalition partner – the UNP, and the SLPP. He has drawn large crowds to rallies addressed by him, with the advantage of government leadership, and public interest in the Bond issue. Yet, he faces a major challenge having to face two rivals – the UNP his own coalition ally and his former leader and party colleagues in the SLPP. He has since widened his anti-corruption campaign by laying new stress on the PRECIFAC Report, which has identified many of his former associates in the Rajapaksa government, and Mahinda Rajapaksa himself, on issues of corruption. His campaign against corruption does have a resonance with the public, but also has the disadvantages of the delay in acting against the corruption of the Rajapaksa Regime, as well as his unconcealed support of the corrupt in uniform, with homage to ‘War Heroes’, involving Gotabhaya Rajapaksa, too. The recent trend of an outright fight against corruption, with threats to use his sword on them, and punishment in hell, have also led to uncalculated mistakes; especially in offering to form a government with all 96 MPs of the SLFP-UPFA, who are with him and those with Mahinda Rajapaksa (MR). Many of the 51 MPs with MR include many against whom the PRECIFAC Report has charges of fraud and corruption. This raises major questions about his commitment to fight corruption, and weakened his position as the polls draw closer. He scored a publicity hit by telling the crooks on both sides – in government and opposition (UNP and SLPP) had joined in putting off a parliamentary debate on the Bond issue and PRECIFAC till after these polls, although wanted it before. The reality was that his own SLFP representatives too agreed to this postponement. But, with the date now shifted to February 6, much of the wind has gone out of his sails on this debate and its impact on the LG Poll. In the context of what is seen as a national referendum on the government, the two opposition parties – UNP (within government) and SLPP – are carrying out their own rival oppositions to President Sirisena’s national unity government leadership. The UNP limited with its position within the ruling coalition, and affected by clear links to the Bond issue, is certainly playing it low – in its attacks on the President, but very strong in opposition to the SLPP and MR. It places more emphasis on its own claims on economic progress in the past three years, seeking to win public support for the continuance of the present government, with its goals of the next Presidential Poll in 2019, and the General Election in 2020. The UNP certainly has major disadvantages with echoes of the Bond issue, where the links between Arjuna Mahendran and Ranil Wickremesinghe are not easily erased, whatever its propaganda seeks to achieve. It has now taken an important step, although far too late, of deciding to remove Ravi Karunanayake from his position as Assistant Leader of the Party. This certainly underlines the many issues about his highly questionable association with Arjun Aloysius and Perpetual Treasures, and the benefits he had from it. On the publicity front the UNP and Ranil Wickremesinghe has a major disadvantage. But, it certainly has strength as the single largest political party in the country, and the strong commitment of its supporters, to remain with it, as seen in the 2015 Presidential Poll and General Election. 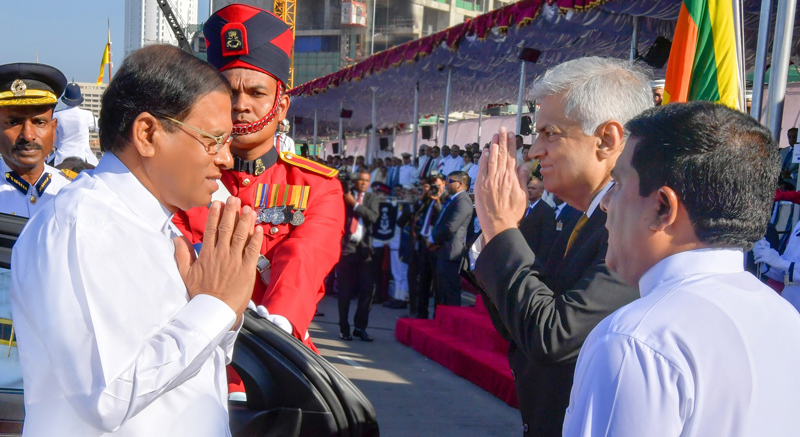 The advantage the UNP has in facing a divided opposition – of both the present and past presidents of the country, remains significant and cannot be erased. It is also necessary to note that a considerable number of new voters in this election will be supportive of the UNP – being unfamiliar with the traditional opposition to the party by older voters. Getting the Lotus Bud of the SLPP to bloom as the votes in this poll are counted, is the major challenge facing its leader MR, and the SLFP big names that remain with him. MR does draw large crowds to his rallies – as seen in the campaign for the Presidential Poll in November and December 2014, and the General Election campaign in 2015. However, these numbers did not turn out very helpful as voters. The challenge before MR and the SLPP is to ensure the large crowds turnout to be large numbers of voters. It certainly has many problems to face on issues of corruption. This could be worse with the government seeking action on the PRECIFAC Report. It, therefore, has to use the Bond issue to best effect to attack both the UNP and President Sirisena, as the leader of the UNP-led coalition with the SLFP-IUPFA. The SLPP and MR certainly have reason to be pleased with the current situation, especially with the delays by the United Coalition, led by President Sirisena, to act on issues of corruption, as pledged to the people in the campaigns for the Presidential Poll and General Election. Much as the cheering crowds show support for MR and the SLPP, the fact that this is not an election to change a government, certainly places the party and its leader at considerable disadvantage. The advantage though is in the reality of local government matters being ignored in this poll, and more being said of government changes. But the post-poll reality is that there can be no government change after this poll. What the public will have to look towards with an interest in this poll is how much the campaign slogans against corruption will be serious, and speedily carried out, unlike the pledges of the Common Candidate for Executive Presidency in January 2015.